I came in a little late and saw Matt deciding that maybe he didn't want to be in Survivor after all, when suddenly he gets another room mate when David showed up. The 3-way duel between Matt, Mike and David was a house of cards competition. Mike stayed alive by finishing first. Matt stayed in the game finishing second. David is gone, and is the first member of the jury. Steve and Phillip got into it over some bad rice, and Phillip played the race card over being called crazy, basically equating it to the N-word. Rob won immunity, guaranteeing he'll be running the game for at least another week. Julie stole Philip's shorts, forcing him to walk around in that really hideous pair of underwear. At Tribal, Phillip accused Steve of stealing his shorts. And even Jeff thought it was unfair to equate "crazy" with the N-word, although he did do a great job of mediating the dispute. And Julie did cop to stealing the shorts. And Julie paid for it by being voted out and sent to Redemption Island. 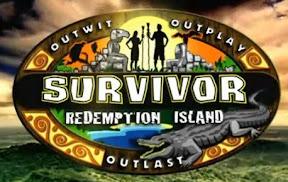 Next week: Matt is really unhappy on Redemption Island. Am I the only one who thinks this season is all about trying to get rob the million? so many games are for his advantage. This may be the last season I watch. Tired of seeing all the repeat players. Keep new blood coming.